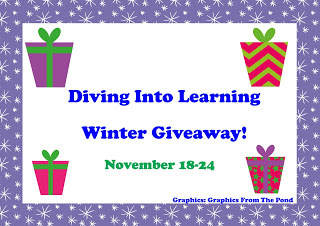 Diving into Learning is having a HUGE winter giveaway! There are over 39 teaching packs/units to be won! She has divided it into categories so that you can enter just K-2 (for example) or you can enter all 8 prize packages. Don’t miss out on this opportunity to win some great new items for your classroom! Click on the link (text under the picture) to enter the contest. Good luck!